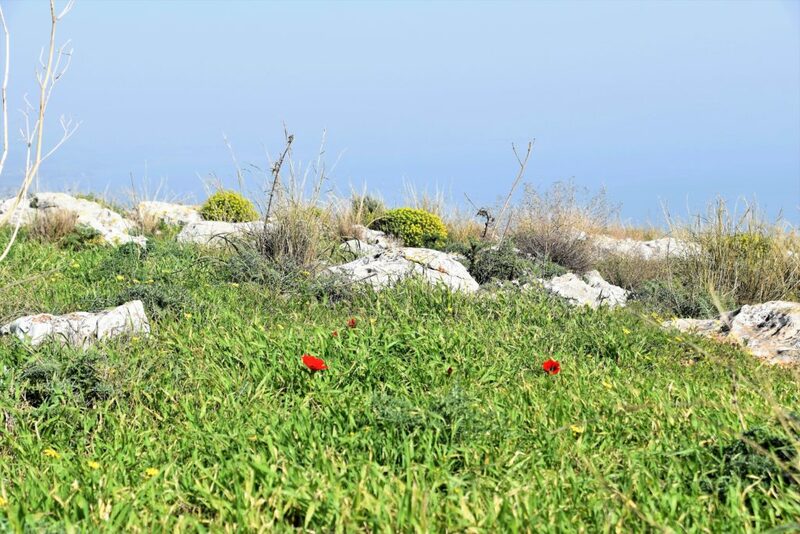 We took some time from our usual schedule last week and visited the nature reserve at Mount Arbel on a beautiful sunny day. 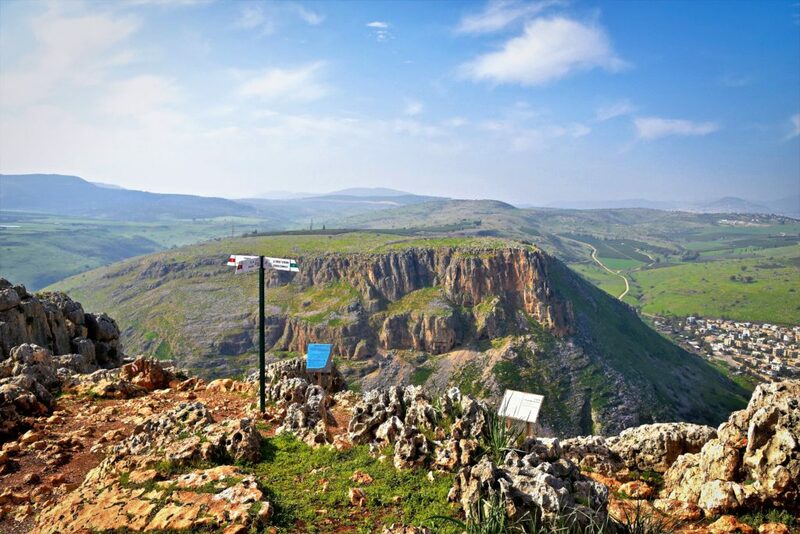 The Arbel features steep cliffs with dramatic views overlooking the Kinneret and the Galil, and a rocky plateau with green meadows dotted with hardy carob trees. 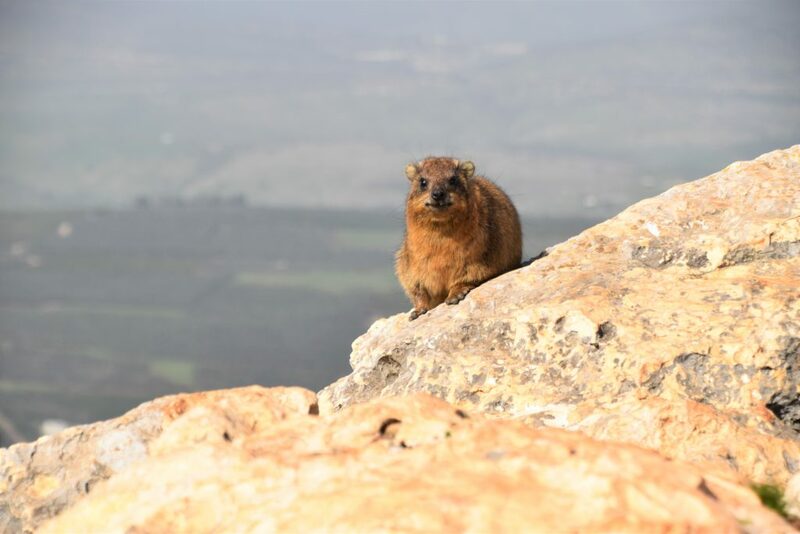 The reserve has several hiking trails, but we wandered off the marked trails, and as we slowed and quieted down we discovered the first brilliant red anemones of the season, birds of species we had not seen before, and a little hyrax that seemed just as surprised to see us. Taking time off, traveling off trail sharpens the senses and opens the mind, and awakens us to the wonders of God’s world. And this is part of the inner meaning of the Mishkan that is introduced in this week’s parashah, the sacred tent that the people of Israel are commanded to build. It’s a paradoxical project, as many commentators point out: ostensibly a dwelling place for HaShem, Who is infinite, eternal and hidden, transcending time, space and consciousness. Ramban points out parallels in the description of the Mishkan and of God’s revelation at Mount Sinai, and explains that the Mishkan is essentially a moveable Mount Sinai, a way for Am Yisrael to bring a location for divine revelation with them as they travel through the wilderness. But it’s not styled as a mountain – it’s a tent. Please let us make a small attic in the wall, and place there a bed and table and chair and lamp, and when he comes to us he can turn in there. The woman of Shunem lists the essential furniture of what we might call today a mother-in-law apartment, and these are exactly the items of sacred furniture we find in the Mishkan. In the outer chamber are a table, a lamp and the chair-like incense altar. Behind the curtain, hidden modestly in the inner Holy of Holies is the Ark, a canopy bed with the wings of the Keruvim forming the canopy. The Mishkan is sort of like a mother-in-law apartment for God. But its most unusual feature, in contrast to temples of the ancient world, is that the Mishkan is moveable, it journeys along with the people as they travel. So it’s kind of a divine RV (Re-creation Vehicle). Basically it’s not much more than a Bedouin tent made of curtains, a little fancier but still quite modest. At the heart of the meaning of the Mishkan is revelation of HaShem, that we are guided to true, clear relationship with HaShem. But to earn this experience we have work to do. This is why the outer court of the Mishkan has a sacrificial altar: before we can approach the Tent of Meeting God we need to purify and rectify ourselves, to fix the broken and twisted aspects of ourselves, to purify and open our hearts and our minds, through the work of Tshuvah. The Mishkan has curtains and openings, public and private spaces – sometimes in the Tshuvah and Tikkun process it’s appropriate that issues remain private, sometimes it’s vital that issues not be kept hidden. In the ancient world this work was thought to be facilitated through sacrifices. When the Beit HaMikdash was destroyed we resorted to the study of Torah and the service of prayer for this work on ourselves. Sages of the Gemara (Berakhot 32b, Ta’anit 27b, Menachot 110a), Maimonides (Guide 3:32) and the Zohar (1:100) suggest that in truth, personal contemplative engagement in Torah and Tefillah are more effective ways to work on ourselves morally and spiritually than sacrificial offerings – and the prophets Samuel (1 Sam 15:22), Isaiah (1:10-17) and Jeremiah (7:1-12, 22-29) had already come to the same conclusion. Rav Leiner is adding that the very process of journeying, the journeys of our lives, all our active experiences and encounters together at all times, are part of this process of purification and rectification that helps bring us to true, real relationship with HaShem. But our life experiences are complicated, sometimes taking us through hard and dangerous places. That the Mishkan journeys with us means that no matter what comes our way, HaShem is closer than close, and we can find a way to bring our most difficult challenges, external or internal, into the positive process that helps bring us to caring, ethical relationships and real personal relationship with HaShem. So we appreciate the opportunities we find for traveling off beaten paths, opening our hearts and minds to HaShem’s wonders and to each other.